For the TV series, see Kiwifruit (TV series). Kiwifruit (often abbreviated as kiwi), or Chinese gooseberry, is the edible berry of several species of woody vines in the genus Actinidia. The most common cultivar group of kiwifruit (Actinidia deliciosa 'Hayward') is oval, about the size of a large hen's egg (5–8 cm (2.0–3.1 in) in length and 4.5–5.5 cm (1.8–2.2 in) in diameter). It has a fibrous, dull and sour but edible greenish-brown skin and bright green or golden flesh with rows of tiny, black, edible seeds. The fruit has a soft texture with a sweet and unique flavour. China produced 56% of the world total of kiwifruit in 2016. Early varieties were described in a 1904 nurseryman's catalogue as having "...edible fruits the size of walnuts, and the flavour of ripe gooseberries", leading to the name Chinese gooseberry. In 1962, New Zealand growers began calling it "kiwifruit" for export marketing, a name commercially adopted in 1974. In New Zealand, the word "kiwi" refers to the kiwi bird or is used as a nickname for New Zealanders; it is almost never used to refer to the fruit. Kiwifruit has since become a common name for all commercially grown green kiwifruit from the genus Actinidia. Kiwifruit is native to north-central and eastern China. The first recorded description of the kiwifruit dates to 12th century China during the Song dynasty. As it was usually collected from the wild and consumed for medicinal purposes, the plant was rarely cultivated or bred. Cultivation of kiwifruit spread from China in the early 20th century to New Zealand, where the first commercial plantings occurred. The fruit became popular with British and American servicemen stationed in New Zealand during World War II, and was later exported, first to Great Britain and then to California in the 1960s. In New Zealand during the 1940s and 1950s, the fruit became an agricultural commodity through the development of commercially viable cultivars, agricultural practices, shipping, storage, and marketing. Much of the breeding to refine the green kiwifruit and develop the gold Zespri was done by the Plant & Food Research Institute (formerly HortResearch) during the decades of 1970-1999. In 1990, the New Zealand Kiwifruit Marketing Board opened an office for Europe in Antwerp, Belgium, which became the headquarters for European marketing of Zespri gold kiwifruit in 2010. The general name, "Zespri", has been used for marketing of all green and gold cultivars of kiwifruit from New Zealand since 2012. The genus Actinidia comprises around 60 species. Their fruits are quite variable, although most are easily recognised as kiwifruit because of their appearance and shape. The skin of the fruit varies in size, hairiness and colour. The flesh varies in colour, juiciness, texture and taste. Some fruits are unpalatable, while others taste considerably better than the majority of commercial cultivars. The most commonly sold kiwifruit is derived from A. deliciosa (fuzzy kiwifruit). 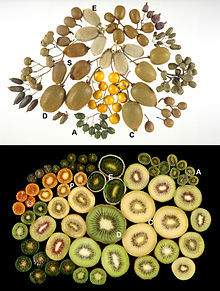 Other species that are commonly eaten include A. chinensis (golden kiwifruit), A. coriacea (Chinese egg gooseberry), A. arguta (hardy kiwifruit), A. kolomikta (Arctic kiwifruit), A. melanandra (purple kiwifruit), A. polygama (silver vine) and A. purpurea (hearty red kiwifruit). Most kiwifruit sold belongs to a few cultivars of A. deliciosa (fuzzy kiwifruit): 'Hayward', 'Blake' and 'Saanichton 12'. They have a fuzzy, dull brown skin and bright green flesh. The familiar cultivar 'Hayward' was developed by Hayward Wright in Avondale, New Zealand, around 1924. It was initially grown in domestic gardens, but commercial planting began in the 1940s. 'Hayward' is the most commonly available cultivar in stores. It is a large, egg-shaped fruit with a sweet flavour. 'Saanichton 12', from British Columbia, is somewhat more rectangular than 'Hayward' and comparably sweet, but the inner core of the fruit can be tough. 'Blake' can self-pollinate, but it has a smaller, more oval fruit and the flavour is considered inferior. Kiwi berries are edible berry- or grape-sized fruits similar to fuzzy kiwifruit in taste and appearance, but with thin, smooth green skin. They are primarily produced by three species: Actinidia arguta (hardy kiwi), A. kolomikta (Arctic kiwifruit) and A. polygama (silver vine). They are fast-growing, climbing vines, durable over their growing season. 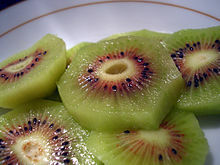 They are referred to as kiwi berry, baby kiwi, dessert kiwi, grape kiwi, or cocktail kiwi. The cultivar 'Issai' is a hybrid of hardy kiwi and silver vine which can self-pollinate. Grown commercially because of its relatively large fruit, 'Issai' is less hardy than most hardy kiwi. Actinidia chinensis (golden kiwifruit) has a smooth, bronze skin, with a beak shape at the stem attachment. Flesh colour varies from bright green to a clear, intense yellow. This species is sweeter and more aromatic in flavour compared to A. deliciosa, similar to some subtropical fruits. One of the most attractive varieties has a red 'iris' around the centre of the fruit and yellow flesh outside. The yellow fruit obtains a higher market price and, being less hairy than the fuzzy kiwifruit, is more palatable for consumption without peeling. A commercially viable variety of this red-ringed kiwifruit, patented as EnzaRed, is a cultivar of the Chinese hong yang variety. 'Hort16A' is a golden kiwifruit cultivar marketed worldwide as Zespri Gold. This cultivar has suffered significant losses in New Zealand from late 2010 to 2013 due to the PSA bacterium. A new cultivar of golden kiwifruit, 'Gold3', has been found to be more disease-resistant and most growers have now changed to this cultivar. 'Gold3', marketed by Zespri as SunGold, is not quite as sweet as the previous 'Hort16A', with a hint of tanginess, and lacks the usually slightly pointed tip of 'Hort16A'. Kiwifruit can be grown in most temperate climates with adequate summer heat. Where fuzzy kiwifruit (A. deliciosa) is not hardy, other species can be grown as substitutes. Often in commercial farming, different breeds are used for rootstock, fruit bearing plants and pollinators. Therefore, the seeds produced are crossbreeds of their parents. Even if the same breeds are used for pollinators and fruit bearing plants, there is no guarantee that the fruit will have the same quality as the parent. Additionally, seedlings take seven years before they flower, so determining whether the kiwi is fruit bearing or a pollinator is time consuming. Therefore, most kiwifruits, with the exception of rootstock and new cultivars, are propagated asexually. This is done by grafting the fruit producing plant onto rootstock grown from seedlings or, if the plant is desired to be a true cultivar, rootstock grown from cuttings of a mature plant. Kiwifruit plants generally are dioecious, meaning a plant is either male or female. The male plants have flowers that produce pollen, the females receive the pollen to fertilise their ovules and grow fruit; most kiwifruit requires a male plant to pollinate the female plant. For a good yield of fruit, one male vine for every three to eight female vines is considered adequate. Some varieties can self pollinate, but even they produce a greater and more reliable yield when pollinated by male kiwifruit. Cross-species pollination is often (but not always) successful as long as bloom times are synchronised. In nature, the species are pollinated by birds and native bumblebees, which visit the flowers for pollen, not nectar. The female flowers produce fake anthers with what appears to be pollen on the tips in order to attract the pollinators, although these fake anthers lack the DNA and food value of the male anthers. Kiwifruit growers rely on honey bees, the principal ‘for-hire’ pollinator. But commercially grown kiwifruit is notoriously difficult to pollinate. The flowers are not very attractive to honey bees, in part because the flowers do not produce nectar and the bees quickly learn to prefer other species of flowers that have nectar over the nectarless kiwifruit. And for kiwifruit, honey bees are inefficient cross-pollinators because they practice “floral fidelity”. Each honey bee visits only a single type of flower in any foray and maybe only a few branches of a single plant. The pollen needed from a different plant (such as a male for a female kiwifruit) might never reach it were it not for the cross-pollination that principally occurs in the crowded colony. It is in the colonies where bees laden with different pollen literally cross paths. To deal with these pollination challenges, some producers blow collected pollen over the female flowers. Most common, though, is saturation pollination, where the honey bee populations are made so large (by placing hives in the orchards at a concentration of about 8 hives per hectare) that bees are forced to use this flower because of intense competition for all flowers within flight distance. Kiwifruit is picked by hand and commercially grown on sturdy support structures, as it can produce several tonnes per hectare, more than the rather weak vines can support. These are generally equipped with a watering system for irrigation and frost protection in the spring. Kiwifruit vines require vigorous pruning, similar to that of grapevines. Fruit is borne on one-year-old and older canes, but production declines as each cane ages. Canes should be pruned off and replaced after their third year. In the northern hemisphere the fruit ripens in November, while in the southern it ripens in May. Four year-old plants can produce up to 14,000 lbs per acre while eight year-old plants can produce 18,000 lbs per acre. The plants produce their maximum at 8 to 10 years old. The seasonal yields are variable, a heavy crop on a vine one season generally comes with a light crop the following season. Fruits harvested when firm will ripen when stored properly for long periods. This allows fruit to be sent to market up to 8 weeks after harvest. Scientists reported they had worked out the strain of PSA affecting kiwifruit from New Zealand, Italy and Chile originated in China. In 2016, global production of kiwifruit was 4.3 million tonnes, led by China with 56% of the world total (table). Italy and New Zealand were other major producers. In China, kiwifruit is grown mainly in the mountainous area upstream of the Yangtze River, as well as Sichuan. Kiwifruit exports rapidly increased from the late 1960s to early 1970s in New Zealand. By 1976, exports exceeded the amount consumed domestically. Outside of Australasia, New Zealand kiwifruit are marketed under the brand-name label, Zespri. In the 1980s, countries outside New Zealand began to export kiwifruit. In Italy, the infrastructure and techniques required to support grape production were adapted to the kiwifruit. This, coupled with being close to the European kiwifruit market, led to Italians becoming the leading producer of kiwifruit in 1989. The growing season of Italian kiwifruit does not overlap much with the New Zealand or the Chilean growing seasons, therefore direct competition between New Zealand or Chile was not a significant factor. In 2017, New Zealand growers were acquiring additional land to grow Zespri gold kiwifruit under rising costs for a Zespri license to meet global demand for the gold cultivar. Kiwifruit may be eaten raw, made into juices, used in baked goods, prepared with meat or used as a garnish. The whole fruit, including the skin, is suitable for human consumption; however, the skin is often discarded due to its texture. Sliced kiwifruit has long been used as a garnish atop whipped cream on pavlova, a meringue-based dessert. Traditionally in China, kiwifruit was not eaten for pleasure, but was given as medicine to children to help them grow and to women who have given birth to help them recover. Raw kiwifruit contains actinidain (also spelled actinidin) which is commercially useful as a meat tenderizer and possibly as a digestive aid. Actinidain also makes raw kiwifruit unsuitable for use in desserts containing milk or any other dairy products because the enzyme digests milk proteins. This applies to gelatin-based desserts, due to the fact that the actinidain will dissolve the proteins in gelatin, causing the dessert to either liquefy or prevent it from solidifying. In a 100-gram amount, green kiwifruit provides 61 calories, is 83% water and 15% carbohydrates, with negligible protein and fat (table). It is particularly rich (20% or more of the Daily Value, DV) in vitamin C (112% DV) and vitamin K (38% DV), has a moderate content of vitamin E (10% DV), with no other micronutrients in significant content. Gold kiwifruit has similar nutritional value, although only vitamin C has high content in a 100 gram amount (194% DV, table). Kiwifruit seed oil contains on average 62% alpha-linolenic acid, an omega-3 fatty acid. Kiwifruit pulp contains carotenoids, such as provitamin A beta-carotene, lutein and zeaxanthin. The actinidain found in kiwifruit can be an allergen for some individuals, including children. The most common symptoms are unpleasant itching and soreness of the mouth, with wheezing as the most common severe symptom; anaphylaxis may occur. ^ a b c d e f g h i j k l m n o p Morton J (2011). "Kiwifruit: Actinidia deliciosa In: Fruits of Warm Climates, 1987". Center for New Crops & Plant Products at Purdue University. Retrieved 8 April 2014. ^ a b c Stirk, Bernadine (2005). "Growing Kiwifruit" (PDF). Pacific Northwest Extension Publishing. Retrieved 4 January 2013. ^ Beutel, James A. (1990). "Kiwifruit". In Janick, J.; Simon, J.E. (eds.). Advances in new crops. Timber Press. pp. 309–316. Retrieved 11 September 2018 – via Center for New Crops & Plant Products at Purdue University. ^ a b "Kiwifruit production in 2016; Crops/World Regions/Production Quantity from pick lists". United Nations Food and Agriculture Organization. 2016. Retrieved 20 February 2018. ^ a b Green, Emily (8 May 2002). "Kiwi, Act II". Los Angeles Times. Retrieved 4 January 2013. ^ Deverson, Tony; Kennedy, Graeme (2005). The New Zealand Oxford Dictionary. Oxford University Press. doi:10.1093/acref/9780195584516.001.0001. ISBN 978-0-19-558451-6. ^ Ward, C; Courtney, D (2013). Kiwifruit: taking its place in the global fruit bowl. Advances in Food and Nutrition Research. 68. pp. 1–14. doi:10.1016/B978-0-12-394294-4.00001-8. ISBN 9780123942944. PMID 23394979. ^ Huang, H.; Ferguson, A. R. (2003). "Kiwifruit (Actinidia chinesis and A. deliciosa) plantings and production in China, 2002". New Zealand Journal of Crop and Horticultural Science. 31 (3): 197–202. doi:10.1080/01140671.2003.9514253. ^ a b c d Mike Knowles (25 April 2017). "NZ kiwifruit: how a major brand emerged". Eurofruit, Market Intelligence Ltd - Fruitnet.com. Retrieved 10 September 2018. ^ a b "Zespri - Official Site". Zespri Group Ltd. 2018. Retrieved 10 September 2018. ^ a b Yang, Hong-Li; Wang, Yan-Chang; Jiang, Zheng-Wang; Huang, Hong-Wen (2009). "[Construction of cDNA library of 'Hongyang' kiwifruit and analysis of F3H expression]". Yi Chuan (in Chinese). 31 (12): 1265–1272. doi:10.3724/SP.J.1005.2009.01265 (inactive 28 September 2018). PMID 20042395. ^ a b "Turners plugs its Enza red kiwifruit – grown in China". National Business Review. 24 February 2010. Retrieved 4 January 2013. ^ a b c d e Ferguson, A. R. (1999). "New Temperate Fruits: Actinidia chinensis and Actinidia deliciosa" (PDF). In Janick, Jules (ed.). Perspectives on new crops and new uses. Alexandria, Virginia: ASHS Press. pp. 342–347. ^ "Hardy Kiwi". Penn State University College of Agricultural Sciences. Retrieved 4 January 2013. ^ Annual report ... annual meeting. 1 January 1996 – via Google Books. ^ Bowling, Barbara L. (1 January 2000). The Berry Grower's Companion. Timber Press. ISBN 978-0-88192-489-3 – via Google Books. ^ "EnzaRed kiwifruit set to take on world stage". New Zealand Exporter. 14 June 2010. Retrieved 4 January 2013. ^ "Frequently Asked Questions: How Was Zespri Gold Kiwifruit Developed?". Zespri Kiwifriut. Archived from the original on 17 January 2013. Retrieved 4 January 2013. ^ "Golden times return for kiwifruit trade". NZ Herald. 26 May 2014. Retrieved 29 August 2014. ^ "Zespri SunGold New!". Zespri. Archived from the original on 15 August 2014. Retrieved 29 August 2014. ^ a b c "Kiwifruit Propagation". University of California-Davis, Division of Agriculture and Natural Resources. 2015. Retrieved 14 July 2015. ^ a b c "Kiwi fruit". The UK Food Guide. Retrieved 4 January 2013. ^ "Kiwifruit vine disease by MAF Biosecurity NZ". ^ Watson, Peter (25 January 2011). "More virulent PSA strain a new worry for kiwifruit growers". The Dominion Post. Retrieved 4 September 2011. ^ Hembry, Owen (25 August 2011). "Relief for kiwifruit industry". The New Zealand Herald. Retrieved 4 September 2011. ^ "Suspected Bacterial Vine Infection". MAF Biosecurity New Zealand. 8 November 2010. Retrieved 9 November 2010. ^ Butler, Margi I.; Stockwell, Peter A.; Black, Michael A.; Day, Robert C.; Lamont, Iain L.; Poulter, Russel T. M. (February 2013). "Pseudomonas syringae pv. actinidiae from Recent Outbreaks of Kiwifruit Bacterial Canker Belong to Different Clones That Originated in China". PLoS ONE. 8 (2): e57464. Bibcode:2013PLoSO...857464B. doi:10.1371/journal.pone.0057464. PMC 3583860. PMID 23555547. ^ Huang, H.; Ferguson, A. R. (2001). "Review: Kiwifruit in China". New Zealand Journal of Crop and Horticultural Science. 29 (1): 1–14. doi:10.1080/01140671.2001.9514154. ^ Sayeeda Bano; Frank Scrimgeour (June 2011). "New Zealand Kiwifruit Export Performance: Market Analysis and Revealed Comparative Advantage" (PDF). University of Waikato. Retrieved 28 November 2012. ^ "Zespri History". Zespri Kiwifruit. Archived from the original on 11 January 2013. Retrieved 4 January 2013. ^ Skallerud, Kare; Olsen, Svein (2011). "Export Market Arrangements in Four New Zealand Agriculture Industrues: An Institutional Perspective". Journal of International Food and Agribusiness Marketing. 23 (4): 310–329. doi:10.1080/08974438.2011.621841. ^ Wilkinson, Tracy (26 May 2008). "Italy leads world as top producer of kiwis". Los Angeles Times. Archived from the original on 13 April 2013. Retrieved 4 January 2013. ^ Gerard Hutching (7 April 2017). "Growers pay steep prices to Zespri for right to grow gold kiwifruit". Stuff New Zealand. Retrieved 10 September 2018. ^ Bekhit, A. A.; Hopkins, D. L.; Geesink, G; Bekhit, A. A.; Franks, P (2014). "Exogenous proteases for meat tenderization". Critical Reviews in Food Science and Nutrition. 54 (8): 1012–31. doi:10.1080/10408398.2011.623247. PMID 24499119. ^ Boland, M (2013). Kiwifruit proteins and enzymes: Actinidin and other significant proteins. Advances in Food and Nutrition Research. 68. pp. 59–80. doi:10.1016/B978-0-12-394294-4.00004-3. ISBN 9780123942944. PMID 23394982. ^ "Seed Oil Fatty Acids – Gesundheitsratgeber: Mit Expertentipps die Gesundheit fördern". jameda.de. ^ Kim M, Kim SC, Song KJ, Kim HB, Kim IJ, Song EY, Chun SJ (September 2010). "Transformation of carotenoid biosynthetic genes using a micro-cross section method in kiwifruit (Actinidia deliciosa cv. Hayward)". Plant Cell Reports. 29 (12): 1339–1349. doi:10.1007/s00299-010-0920-y. PMID 20842364. ^ Sommerburg O, Keunen JE, Bird AC, van Kuijk FJ (August 1998). "Fruits and vegetables that are sources for lutein and zeaxanthin: the macular pigment in human eyes". British Journal of Ophthalmology. 82 (8): 907–910. doi:10.1136/bjo.82.8.907. PMC 1722697. PMID 9828775. ^ a b "Allergy – Fruit and Vegetable Allergy | The Sydney Children's Hospitals Network". www.schn.health.nsw.gov.au. Retrieved 15 October 2015. ^ a b Lucas, J.S. ; Lewis, S.A.; Hourihane, J.O. (2003). "Kiwi fruit allergy: a review". Pediatr Allergy Immunol. 14 (6): 420–428. doi:10.1046/j.0905-6157.2003.00095.x. PMID 14675467. ^ Le TM, et al. (2013). "Kiwifruit allergy across Europe: clinical manifestation and IgE recognition patterns to kiwifruit allergens". Journal of Allergy and Clinical Immunology. 131 (1): 164–171. doi:10.1016/j.jaci.2012.09.009. PMID 23141741. Vietmeyer, Noel D. (May 1987). "The Captivating Kiwifruit". National Geographic. Vol. 171 no. 5. pp. 683–688. ISSN 0027-9358. OCLC 643483454.